Handmade cards that you make, especially those made to sell or give as part of a special gift, can look far more professional when you use double-sided tape. The special double-sided tape mounting technique demonstrated here is the most professional way to stick straight edged papers onto greeting cards and into your scrapbooks. This technique has the added benefit that you are able to reposition items before they stick permanently in place. Double-sided tape can give a perfect finish because it is not visible through most types of paper or photographs. Glue sticks and liquid glues are often messy to use and can leave smears and unsightly bumps on your finished handmade item. Many types of paper based crafts, especially card making and scrapbooking, can benefit from using an adhesive that is as clean and mess-free as possible. 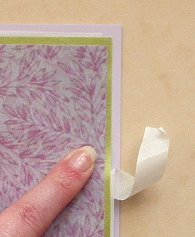 It is very easy to spoil a completed greeting card or a page layout if you use the wrong type of glue. I use a range of adhesives for all the different paper crafts that I enjoy but one of the main ones I like is double-sided tape. 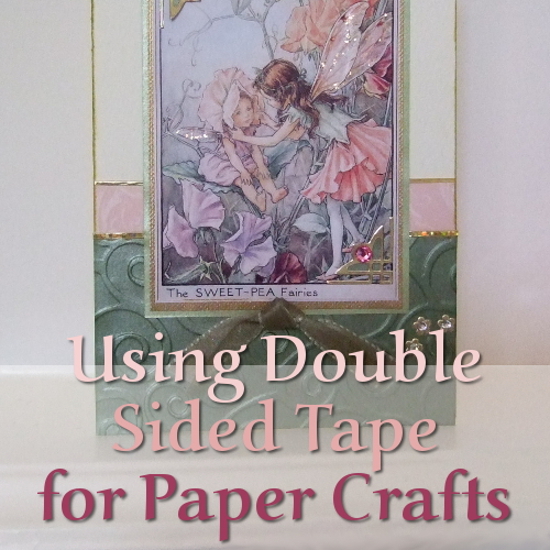 I tend to use double-sided tape most often for mounting up patterned paper backgrounds, pictures and photographs when making my own cards. 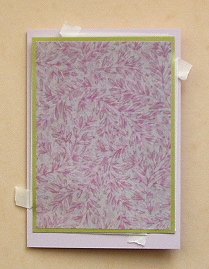 It is particularly useful for layering up background papers on to craft projects because it lies perfectly flat and, since it is a dry adhesive, the paper does not pucker underneath. 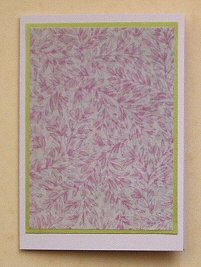 One common technique for card makers is to place backing papers on the front of a greeting card blank before putting embellishments and other forms of decorative elements on top. 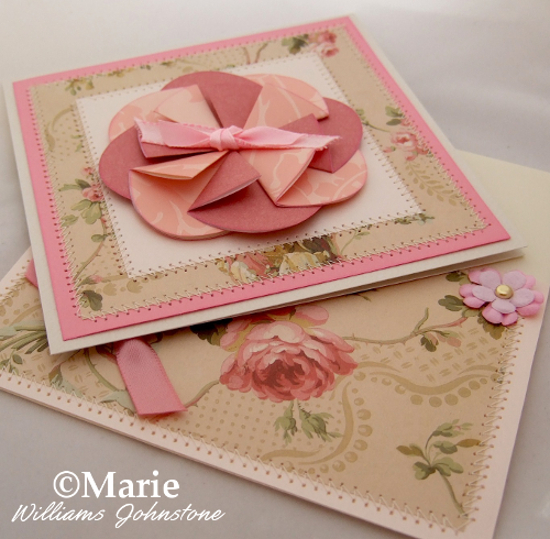 Layers of paper can create a colored or patterned background for handmade cards and scrapbook page layouts. I love to layer up papers, so I might end up with two or three different ones which make up the overall background design. There are lots of ways in which you can stick these papers down and you might choose a glue stick or pen, white PVA based glue or something else. I really recommend that you think about using double-sided tape because it provides a really clean and no-mess method which makes papers lie perfectly flat, giving a really professional finish. For mounting up pictures, photos or paper, the technique demonstrated here will give you excellent results. I prefer to use tape which comes on a roll but you can also get it on a dispenser too - just make sure there's a backing strip that you can remove. The backing strip allows you to use a repositionable mounting technique. This means that you can test out where the paper will sit on your layout before sticking it down permanently into place. Scor-Tape is a brand of tape suitable for paper crafts and scrapbooking due to it being acid-free and heat-resistant which means that you can use it along with embossing powders too. It is nice and sticky and you can tear or cut it to the size that you need. Choose the photo or paper that you want to place on your greeting card front and trim it to the correct size. Now flip it over on the work surface in front of you so that the reverse side of the paper is visible and facing you. Tear or cut off a piece of double-sided tape that is the right size to fit down one side of the paper. You can apply this to the back of the paper along one edge but do not remove or peel off the backing strip. Repeat this process for every side that you want to stick down. Tearing the tape, if you can, is so much quicker than stopping to pick up scissors to cut it. Yours may come on a dispenser which allows for quick cutting. I find rolls of this tape easier to use than dispensers since they make it easy to quickly measure out a length of tape against the project which I then tear to size. Still keeping the paper with the reverse side up, peel away a small piece of the protective backing from one of the pieces of tape. Just fold back a small piece. I tend to always choose the top left corner. Turn your paper around and repeat this process on the corner of every piece of tape. If you're using a square or rectangular piece of paper, you'll end up with 4 backing strips folded back at each corner. 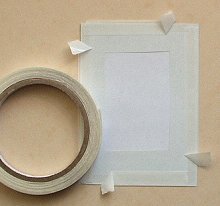 If you find it hard to remove the protective backing from the double-sided tape, do the following. Press your thumb firmly over the end and then use your nail or a pair of craft tweezers to separate the backing strip from the adhesive and lift it up. Some brands of tape are easier to manipulate than others. When you're done lifting up the corners of all the backing strips, turn your paper or photo over on to its front and lightly hover it over your craft project. Having only the corners of the double-sided adhesive exposed means that you can easily move your paper or photo around. You can take the time to put it exactly where it needs to go before you stick it down permanently. Because, like most adhesives, once the tape sticks you won't be able to remove it without either tearing your paper or your project. When you are sure that the photo or paper is in the right place on your project, press into the corners to first stick the adhesive sections down. You should still be able to move your paper at this point if you've made a mistake over placement. To stick it down permanently, you need to take off the backing strips. Working from one of the corners, press a finger near the same edge and then, with your other hand, take hold of the folded flap of backing strip. Gently and slowly pull it down towards you until you remove the entire strip. Smooth the paper down so it is nice and flat, then turn your whole project around to repeat the process and take out all the remaining backing strips. Once they're all removed, you should end up with a perfectly smooth piece of paper or photo stuck firmly to your card. The photo above shows my example of a greeting card made using lots of papers layered using the method demonstrated. The technique made it easy to line up papers exactly where you want them. Many glues, even stick ones, can leave unsightly marks and uneven surfaces on your card. If you're aiming for a professional finish, you may want to start making some good use of double-sided tape. It’s always in my craft box, ready for my next project. If you are selling your handmade cards or making them for special occasions, you'll want them to look as good as possible. The beauty of this particular mounting method is that it allows you to move your paper around until it is perfectly placed and you can stick it down permanently. This makes it a great choice of adhesive for sticking in your own handmade card inserts as well. Liquid and stick glues can result in unsightly lumps and smears forming as you use them. With this tape technique, there is absolutely no mess. You can even use this method as a fast way to stick down large 12 x 12 inch papers as backgrounds for a scrapbook page layout. There are several benefits to using this special mounting technique that works with many paper crafts.